Do commercial uses fit in Albemarle County’s rural areas? 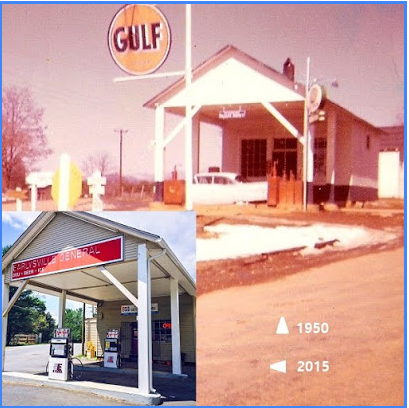 Looking at the photo to the right of Earlysville General Store, I would say not only do they fit, such uses (and the owners, employees and patrons) are the very fabric of the community for generations. But such community supportive land uses are now in jeopardy. On Wednesday night (6/13), the Albemarle Board of Supervisors will be considering a zoning text amendment (ZTA201800002) that would significantly reduce the number of uses allowed on property that is zoned commercial in the rural areas. This proposal has sped through the County’s approval process faster than any in recent memory. Their “need for speed” is not clear and an e-mail requesting more information has not been returned. Throughout this speedy process, there has been significant discussion regarding the impact of this land use change on property values. In testimony before the Planning Commission several residents suggested the value could drop by up to 90%. One speaker indicated that a potential real estate contract is in peril because of the proposed ZTA. Anecdotally, we have seen property values diminish with reduction in rights but it was not until we read a 2006 paper by Oregon State University professor William K Jaeger that we found empirical evidence of such property value deimmunization. 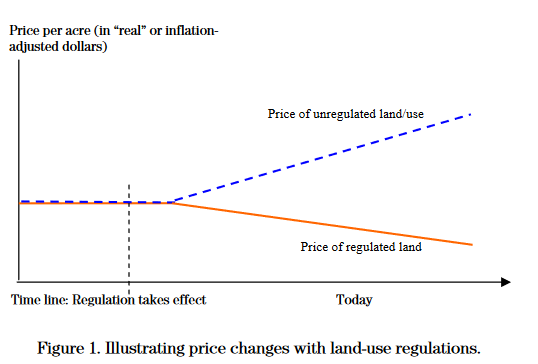 Jaeger’s research is very careful to paint a broad brush regarding property values but provides an interesting window on the comparison between regulated and unregulated land costs. Given the possibility of a price effect for both regulated and unregulated land due to the land-use regulation, it would be presumptuous to attribute the entire price differential between the two markets to a reduction in property values for the regulated lands. To use an analogy, if you tie your boat to a coastal pier and then, after a period of hours, notice that the level of the boat is now below the level of the pier, you are unlikely to ask: Did the pier move up or did the boat move down? You will immediately understand that piers don’t move up, but that an outgoing tide could have easily caused the boat to fall. 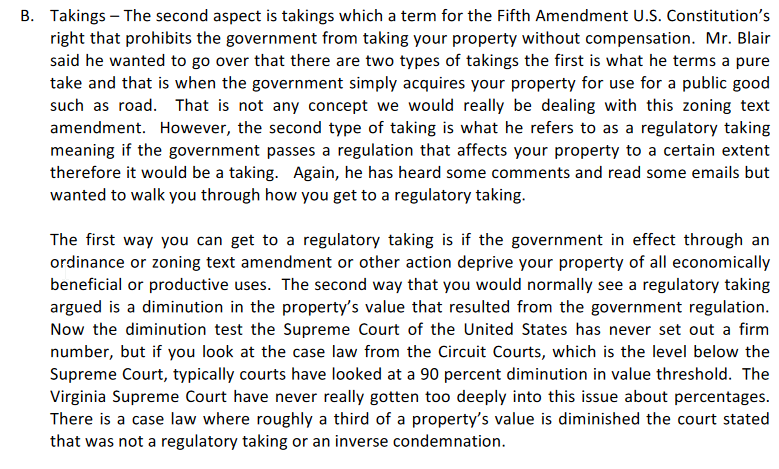 Considering the significant number of variables in any real estate transaction, and the Supreme Court’s decision regarding loss of up to 90% dictating a taking, I believe this loss of property rights would not meet the legal definition of a taking. Even if it is legal is it right? Why then are these ~80 rural properties being effectively downzoned so quickly? 1. Albemarle’s Board of Supervisors closed meeting earlier this summer one topic announced to be discussed was a Zoning Text Amendment and ongoing litigation. 4. An e-mail asking the direct question of Albemarle County staff went unanswered last week. If the Albemarle Board of Supervisors is pushing this agenda due to a specific court case, the Free Enterprise Forum believes the public has a right to know. It’s a shame a bad law (400 gallons of water use per acre per day) is now being replaced by one that is even worse. We continue to believe a thoughtful discussion of performance standards could produce a significantly improved ordinance that could more properly balance property rights and the community goals. But that would take time, something seemingly the Supervisors don’t have. Next Is Charlottesville ready for Collins’ Affordable Housing “Marshall Plan”? It is sad when people elected by by the citizens of a community forget who they represent. This happens in all levels of government. In this case rural Albemarle County. My early childhood days were in rural Earlysville, it was a farm community with three stores, a garage, a post office in someones home, a school and churches. Now it is mostly a bedroom community for Charlottesville. Local businesses serve the people of the community. It is difficult for them to compete with the large chain businesses. The more restrictions you place on these businesses the less privately owned businesses remain and the less services are available to the local community. I have always thought the Albemarle County Board of Supervisors made decisions to protect and benefit the citizens and businesses in the County, unlike the City Council of Charlottesville. To protect and maintain free enterprise must be the objective. Citizens have invested their hard earned to purchase and build their business under the laws at the time. Laws like the water usage being regulated by acres of land show ill judgement. Some of the larger water use businesses require small parcels of land. A car wash or laundry are the first that come to mind. No, I am not a business owner, I am a citizen of the Earlysville community. I volunteer at a non profit business and an a customer of several others. Please do not eliminate our rights, protect them. Free Enterprise is America.